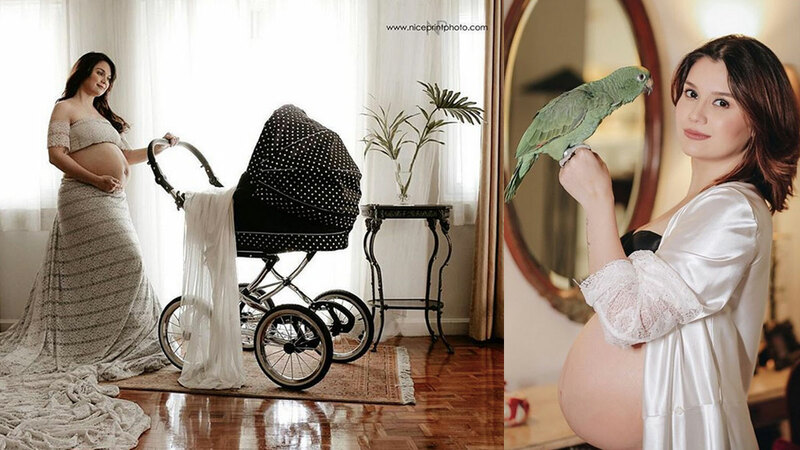 Nadine Samonte, 31, held her maternity shoot with Nice Print Photo at home due to her delicate second pregnancy. Nadine Samonte was glowing during her maternity shoot with Nice Print Photo. There were no tell-tale signs at all about the health condition that she still continues to hurdle. In another post, she revealed her "daily routine." The StarStruck alumna wrote, "Now taking 30 tablets a day, once a day (Innohep) injection, and every 3 days Proluton injection. "I have actually 2 folders [for] my medicines and ultrasound, and the other folder are my Results bawat tests and prescription." Just like her first pregnancy, her second is also delicate. Remember the 53 tablets she had to take when she was pregnant with her eldest child, Heather Sloane? That did not include the twice-a-day Heparin injections and once-a-week Proluton injection she had to endure. She continued, "Wow grabe i cant believe nagagawa ko mag inject sa sarili ko na super scared ako sa injection lahat talaga gagawin mo para sa anak noh?" But her struggles were nothing compared to the joy of motherhood. "Honestly, nakakapagod, pero it's gonna be worth it again super. Thank you God for all the strength." Nadine went on talking about her APAS (Antiphospolipid Syndrome), an autoimmune disorder, and PCOS (Polycystic ovary syndrome), a hormonal disorder causing infrequent or prolonged menstrual periods. The 31-year-old celebrity elaborated, "It's about my immune system na it's super strong that anything comes inside my body like viruses or anything, my body is killing it, kaya hirap ako mabuntis. Hindi po ako na-miscarriage kasi nga papasok pa lang siya, my body is killing it na. My category is 1, 2 and 5. "Madami nagtatanong what's my medicine, I can't say kasi iba-iba cases po natin, and it depends sa ibibigay ng doctor. My Doctor is Dra. Chiaoling Sua-Lao. She has a clinic at Binondo, The Medical City Ortigas, and Manila Doctors Hospital. "I'm posting this kasi nagflo-flood na DM ko about information, what's my case and doctor and kung anu pa. I'm happy and willing to help about infos kaya pinost ko na 'to. "Sa mga gumi-give up, basta don't give up, always remember there is always a reason for everything. Have faith and pray thats what we did. And of course find a very good doctor to help you. "Thank you also to all your prayers. God is good. Hindi niya tayo pababayaan. Mga APAS mommies, I feel you, and we are lucky to have our rainbow babies. We made it #beablessing #Godisgood #helpeachother." (Ed's note: Punctuations were added for brevity). Nadine is 30 weeks pregnant with her second baby. Her sonogram dated March 19 showed that the actress and her husband Richard Chua are going to have a baby boy, whom they will name Austin Titus.